Howdy, Pardners! We here at Petticoats & Pistols are super excited about the upcoming week because we’re going to be in full-on party mode! That’s because we’re celebrating the 10th anniversary of the blog. That’s right, 10 years of posts about our love of all things western. A full decade. In honor of that milestone, we’re going to be having daily “10-themed” posts from lots of the Fillies. You won’t want to miss these posts for the sheer fun, for one, but also because commenting will earn you chances to win daily prizes as well as one of three awesome grand prizes we’ll be giving away at the end of the week of partying until we drop. And the more you participate, the more chances you get to win those grand prizes. So comment often and be sure to take part in our fun scavenger hunt that will take you on a journey for answers through our individual author websites. 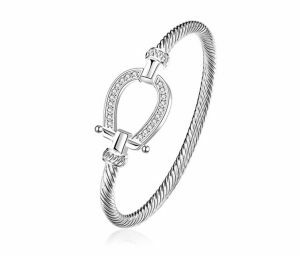 You’ll find the contest entry form at the bottom of this post. Please read all the rules before you begin. Following the listing of the prizes below, you’ll find all the clues for the scavenger hunt so you can get started. Just check out all that’s part of the grand prizes. Honestly, I kind of want to win them! Kathryn Albright — In Mail-Order Brides of Oak Grove, what is the name of the cowboy that first lays claim to Maggie McCary? 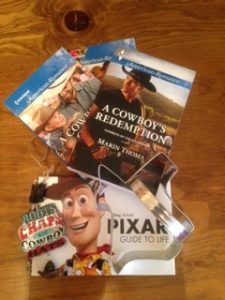 Linda Broday — In which book did the cowboy win a baby in a poker game? Margaret Brownley — Margaret’s A Match Made in Texas series was inspired by what favorite childhood book? Mary Connealy— What three awards are mentioned on Mary’s website? Pam Crooks — What was the evil warden doing that forces Hannah, the heroine in Hannah’s Vow, to go to the penitentiary to help investigate? 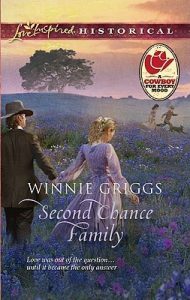 Winnie Griggs — Which of Winnie’s books feature a schoolteacher who tries to play matchmaker for a sawmill owner? Tanya Hanson — What is Tanya very afraid of? Karen Kay — In which book is the heroine escorting several orphans out West when the hero, a Cheyenne Warrior, raids a train in search of his brother, who has been taken captive? 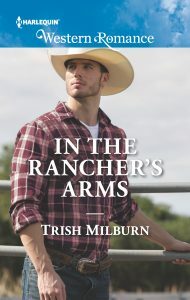 Trish Milburn — Which book has a heroine who has recently been rescued from human traffickers? Phyliss Miranda — What is the name of my assistant and what is unusual about her talents? Jeannie Watt — Which two of Jeannie’s books deal with bull riders and adorable twin girls? 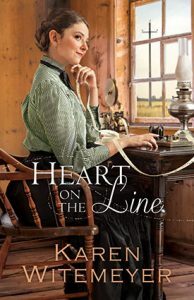 Karen Witemeyer — What 19th century book inspired Karen’s telegraph romance, Heart on the Line (Ladies of Harper’s Station series)? Marin Thomas — How many books does the moving banner display on the Home page of Marin Thomas’s website? Monday – Winnie Griggs and Linda Broday will share their views on the 10 Best Western Songs/Ballads. Tuesday – Karen Kay and Phyliss Miranda will be discussing 10 Western Heroes and Heroines. Wednesday – Karen Witemeyer and Jeannie Watt will keep the conversation likely with their list of Top 10 Favorite TV Westerns. Thursday – We welcome our newest Filly Marin Thomas, who will kick off her new Filly-dom by telling us a bit about herself and her recent trip to Globe, Arizona. 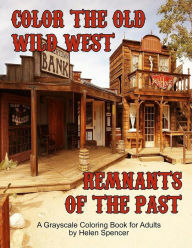 Friday – Guest blogger Pam Hillman will share the 10 Snags of Writing Colonials vs. Westerns. Saturday – Kathryn Albright & Margaret Brownley will talk about their Top 10 Favorite Western Sayings. Sunday – Pam Crooks, who has been here since the beginning of Petticoats & Pistols, will post about The 10 Fillies Who Started it All. We sure hope you’ll join us throughout the week as we celebrate! And good luck in the giveaways! NOTE: If you want to enter the giant giveaway, you must use this form. Leaving a comment (which highly encouraged–this is a party, after all) will not enter you in the big giveaway. Happy 10 years. I look forward to celebrating every day. Thanks, Janine. We’re looking forward to all the fun we’re going to have celebrating this week. Happy 10th anniversary. I have enjoyed your blog for a number of years. Thanks, Estella. We appreciate you being a dedicated reader. Thank you! We wouldn’t be here without people like you. Thanks, Dale. We hope everyone has a good time with the posts and scavenger hunt this week. Thanks, Colleen. We hope everyone enjoys it. HAPPY 10TH ANNIVERSARY! Looks like a busy fun week. Thanks, Rosie. Hope you have fun with our festivities this week. Thanks, Eliza. Hope you pop by each day. Here’s to many more 10s! Thanks and Happy Anniversary! Thank you, Eva. And be sure to spread the word about our party this week! 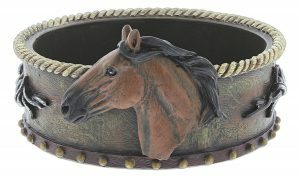 I have my horse saddled and my boots ready for a fun-filled week. Can’t wait to read all the other fillies posts about their favorite 10 things and find out more about our new filly, Marin Thomas! I am READY TO CELEBRATE! Whee! We’re going to have a ball this week. Congrats on ten years. What a great way to celebrate. Happy 10th Anniversary and we’re wishing for that many more (at the least)! So are we! Thanks, Connie. Congratulations on the 10 years!!! So amazing!!! Thanks, Caleigh. And good luck to you, too. Congratulations! Sounds like this will be a fun week! Congratulations on your 10th anniversary! May you have many more successful years. Thank you, Karen. We appreciate the good thoughts. Thanks, Maureen. Hope you have fun with us this week. Happy 10!!! This is so exciting!!! Happy 10th. Love the big giveaway but I especially love the authors. Thanks Deana! And we love all our readers as well!! What fun. It was nice learning more about the authors and seeing some of their books I didn’t know about. Great prizes. I am a bit partial to #1, but whoever wins any one of them will be very lucky. All great authors with books that are well worth reading. We’re glad you enjoyed the scavenger hunt, Patricia. 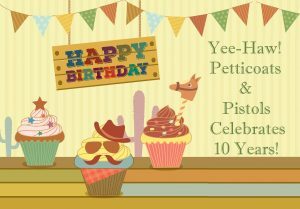 Wow, happy decade, Petticoats and Pistols! That 10 years have flown by in the blink of an eye! Here’s to the next 10, everyone! Congratulations, Fillies! A decade of rock solid blogging is a huge accomplishment! I think the popularity of different types of stories go up and down over the years, but I don’t think anything is ever truly dead. Not as long as there are readers who enjoy them. YAY! Happy 10th Anniversary to one of my favorite blogs!! Wow, it was fun reading about all of the authors, I now have more authors that will be added to my TBR list Congratulations of your 10th anniversary. Here’s wishing all of you many more years of great writing. Congrats and Happy 10 years. An awesome time will be had . Good luck to everyone. Thanks, Carol. Hope you’re having fun with us this week. This sounds wonderful! Happy Annv! Happy Anniversary to all! Best Wishes for many returns of this special celebration! Thank you, Pat, for the support. I’m so happy this has been going for 10 years!!! I have found so many great authors and books here! I absolutely love this place!!! Thanks! We’re so happy you love it, Cori. Thank you. I look forward to becoming a reader and a continued fan. Thanks for the scavenger hunt! I’m going to have to spend more time adding some books to my TBR list! Happy anniversary to all of you! I will continue to read and comment and I look forward to 20 more years. I have many of these authors for the last few years. Glad to find this site now. 10 years! Boy do I have lots of catching up to do! Happy Anniversary!! ???? I’m new to Petticoat myself and I’m so very excited to read all about everyone love you Karen Kay! Congratulations on your 10th anniversary!! I stop by periodically and didn’t realize it had been 10 years since you started the blog, wow! Thank you so much for the opportunity to win so many great prizes!